If you are like me, sometimes you don’t read the directions to a recipe fully, you just read the list of ingredients. That happened to mine this weekend. I needed to have 3 sticks of butter softened. I turned on my oven and took out my frozen butter. I placed the butter on the edge of the stove where it is hottest. 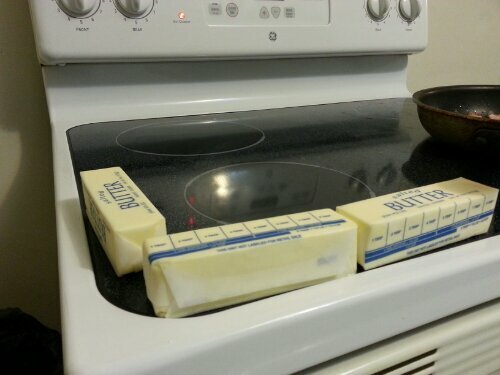 As the oven preheats, the butter also softens. I also did any other prep work for the recipe to make sure it was good and soft. Just make sure you take the butter of the stove before it melts! This entry was posted in Food, Tips and tagged baking tips, butter, cooking tips, kitchen, kitchen tips, noodmood, protip, recipe tips, soften butter. Bookmark the permalink.